Italian film actress born in Rome (Italy) on September 20, 1934. His real name is Sofia Villani Scicolone. His father was an engineer and Sicilian baron, who abandoned the family when born his sister María. He/She was educated by her mother in Pozzuoli, a small town near Naples. At the age of 11 he/she was already attracted to the world of the American movies, which were very popular in Italy. However, before he/she devoted himself to studying teaching, although he/she would never finish it. In 1949 he/she managed to stay well rated in a beauty contest, specifically second place in the contest "Princess of the sea", in Naples, and in 1950 was appointed Miss elegance in another contest that took place in Rome, in the election of Miss Italy (which did not get). She debuted in film as a helper, in those same years, in films like Quo Vadis? (1951), Mervin Leroy, at the time involved in fotonovelas, where he/she worked under the pseudonym of Sofia Lozzaro. They began to have opportunities in the world of cinema, partly because of its great beauty, a beauty that is opulent and generous, posed a strong hook to attract viewers. Throughout the early fifties he/she took part in a series of minor films. Soon he/she met film producer Carlo Ponti, who was much older than she, which fell in love and married in 1957, becoming his real mentor, and transforming it into one of the most important personalities of the cinema in the second half of the fifties to the near present day. 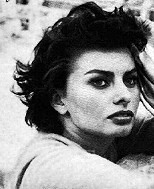 From this change in your situation, Ponti made her participate in irregular, although of some impact films at the time, as in the case of man or Devil (1953), by Pietro Francisci. Then starred in the thief, his father and the taxi driver (1955), by Alejandro Blasetti. Under the auspices of her husband, he/she received a call from Hollywood and worked in the Mermaid and Dolphin (1956), Jean Negulesco, and the pride and the passion (1957), Stanley Kramer, set in the war of Spanish independence and with a cast involving Cary Grant and Frank Sinatra (it is said that Grant was during the filming of engage in a romance with the beautiful Italian(, but their efforts did not succeed). He/She also had the opportunity of working with John Wayne in sands of death (1957), with address of Henry Hathaway. In 1960, already with a style more perfected and converted into a true actress, won the Oscar for best actress for her impressive work in two women, directed by Vittorio de Sica, and whose action is located in the Italy of the second war world, during the arrival of the Allied troops. This movie shot a television version later. Maggiorata, the piazzola, had become a woman with class and distinction, by the grace of his intelligence and his "Pygmalion", her husband Carlo Ponti. When producer Samuel Bronston was preparing the shooting of El Cid (1961), who would have to carry out Anthony Mann, and after discarding SaraMontiel, gave to the Loren the role of Jimena. The film, in terms of western, with a screenplay by Philip Yordan, built a vast and interesting story about the Spanish hero of the middle ages. Along with Charlton Heston, they composed a couple with more attractive and chemistry of what one could think at first. He returned to Italy and wheel, again under the command of De Sica, Boccaccio 70 (1961) and the condemned of Altona (1962), two films with ambitions of quality, within a European cinema which was beginning to lose the battle against the American, among other reasons because it focused more to an intellectual audience than to the majority; European cinema, in short, was well-regarded by critics, but it has condemned him to be too cyclical. At this time returns to the cinema show with the fall of the Roman Empire (1964), a new production directed by Anthony Mann Bronston. At the end of the 1960s and during the 1970s he/she worked in a series of Italian films that had good response from public. The Loren had become a real star, who could afford any type of paper and whose work was beyond criticism, used to judge her above many of the titles in which the protagonist plays. It was "a great lady"; He/She was over forty years old and his physique had become elegant. Did not remember now the girl of the fotonovelas from its inception. But it was also an excellent actress. Films of this period sunflowers (1969), include the excellent a special day (1977), and Vittorio de Sica, mortadella (1971), of Mario Monicelli, EttoreScola. At the end of the 1980s begins its decline, that although it affects them in terms of their participation in films, is not from the perspective of its popularity and fame among a society that has become one of the symbols of reference. In 1994 appeared alongside Marcello Mastroianni in prêt-à-porter, a film by Robert Altman, with pretty bad results at the box office, despite having a large number of 'commercial' from the American film actors, but that, nevertheless, continues to be a special critique of many of the tics of the fashion world. Sophia Loren has been the great diva of European cinema and prototype of Mediterranean beauty, but, also, a woman who knew how to take a path that took him from the sympathetic vulgarity to be considered a great Lady of the cinema world. In addition to the Oscar, he/she obtained the honorary Cesar French film. In 1994 he/she was awarded a Golden Globe and in 1995 received the Italian Argento Nastro. In 1997 was awarded the order of "Knight of the Republic" at the hands of the Italian President Oscar Luigi Scalfaro, who never forgotten the years in which it was judged and even imprisoned for evasion of foreign exchange. He/She has two children from his marriage with Carlo Ponti. In September 2004 the Roman actress celebrated his seventy birthday with the premiere on the small screen of the land of the return, a Telefilm that plays a schoolteacher in a small town. The actress stated to feel "triumphant". On the other hand, in June 2005 visited the land of his childhood, the small town near Naples called Pozzuoli, where made landfall shortly after birth in Rome in a hospital for mothers, since yours wanted it to grow where his family's roots were. The actress received with joy and not a few tears the band pointing you as a citizen of honour, and he/she met old classmates in a festive day for the Neapolitan town. 1949: Cuori sul mare.1950: Le sei moglie di Barbablù; Il vote; IO sono il capataz.1951: was lui, Yes, Yes; E l' afinador arrivato; Quo Vadis? ; The last Fox; Ana; Il mago per forza.1952: Africa under the sea; The favorite; Tratta delle bianche.1953: happened in Rome; Aida; CI troviamo in galleria; Neapolitan carousel; Tried the Italian; Il paese dei capanelli; Man or demonio.1954: Ambassador of love; Our times; Nights of Cleopatra; The gold of Naples; Misery e nobilita; The girl in the river. 1955: The thief, the father and the taxi driver; The beautiful peasant; The sign of Venus; Bread, love and...-1956: pride and passion; Lucky to be a woman; Mermaid and dolphin. 1957: Cintia; Muerte.1958 Sands: the key; Wish under the olmos.1959: that kind of love; Orchid negra.1960: the gunman of Cheyenne; Capri; Scandal in the Court; The Millionaire; Two mujeres.1961: Madame Sans-Gêne; The Cid; Boccaccio 70 (episode). 1962: A chasm between the two; The kidnapped of Altona.1963: yesterday, today and manana.1964: the fall of the Roman Empire; Operation Crossbow; Marriage to the italiana.1965: the venus of wrath; Lady l 1966: Arabesco.1967: the Countess of Hong Kong; The beautiful and his ghost; There is always a mujer.1969: the girasoles.1970: the woman of the cura.1971: Mortadela.1972: white, red and..., the mancha.1974 man: brief encounter; The verdict; The viaje.1975: Pupa, Charlie and his gorila.1976: Cassandra.1977 Bridge: A particular day; Angela.1978: Target: Patton; The widow innoble.1979: the power of the fuego.1984: Aurora.1985-three lovers: Machos di guerra.1994: prêt-à-porter. 1995: discords to the carta.1997: Soleil.2002: between strangers.